To us, being the best among our peers isn't an idle boast. It is a never-ending commitment to improving our performance and being better than we were last year, a month ago, even yesterday. We are never satisfied with the way things are. We are always focused on how things could be better. We institutionalize standardized operations and strict quality controls to which we hold ourselves accountable. We examine, monitor, and measure our operations in order to discover new ways to achieve a higher standard, and, in turn, improve our performance. It's a continuous improvement process that constantly moves us forward. We are accountable to all stakeholders. Our transparency to families, residents and the community at large, add an extra level of scrutiny that pushes us to excel. We deploy the technology that enables us to manage our operations more accurately and efficiently and to make informed decisions without delay. We believe absolutely in the value of continuous learning and the transfer of knowledge to our staff through training programs so that they are able to use best practices and provide the best level of care to our residents. We are constantly researching emerging technology and assessing its value to further our ability to return time to care in our homes. 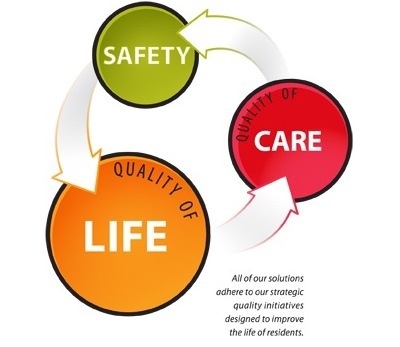 Quality of care, quality of life and safety are our three guiding principles that drive everything we do. We enhance the safety of our staff, our residents, their families and the community, and we will always explore ways to increase the level of safety in our homes. And when we ask ourselves the question: "Does this help our residents live better by promoting quality of life?" The answer has to be yes.